Get ready for the Spring selling season by staging your property for maximum appeal. 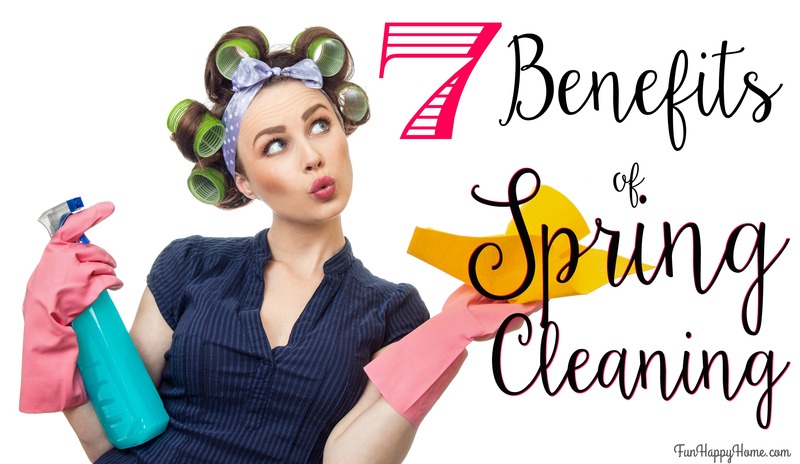 Spring cleaning, along with setting the theater, help buyers envision themselves in your house and prepares you for more successfully getting under contract and at once for the move. Washing your windows, as well as opening or removing your curtains and drapes) will bring in more light and make your rooms seem bigger. Potential buyers want to see how much light each room gets, and keeping window treatments in place, regardless of how much they tie the room together, tend to make a room feel darker and dated. Potential buyers want to be able to envision themselves in your space. They can't do that if your walls are full of pictures from your family vacation or if your kid's toys are all over the living room. Think about tidying up as soon as you decide to sell your home, so you won't have to rush to prepare for showings. Less is more. Clear out with tag sales, craigslist, front porch forum and ebay. Turn your clurtter into gains to turn over a new leaf. Potential buyers will open every closet and every cabinet, if they are full to the brim with things you will give buyers the subconscious notion that your home is lacking space, the same goes for the garage. This is a great opportunity to get a jump-start on packing too. Steam your carpets, polish your wood floors (think about restaining if they're really worn out), and mop tile floors. Remove area rugs from the kitchen, it will immediately make the room feel cleaner. Roll up your old rugs, hardwood floors are a huge selling point these days. It's amazing how much a can of paint can improve things. A neutral home appears larger. Stay away from trendy colors so you have less of a chance of turning off potential buyers. If you would rather save your money, washing your walls can also go a long way to freshening up the walls. 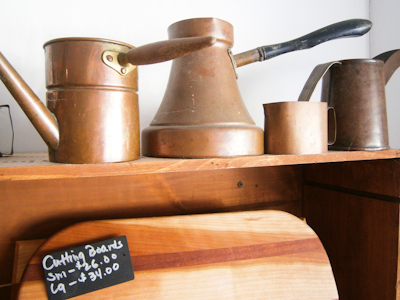 Over the years walls collect dust and dirt, taking the time to scrub the walls clean can really spruce up a room. It does take a while and you need to wash at least one full wall at a time because spot cleaning will be very noticeable. Aromatherapy is far more than spiritual healing. 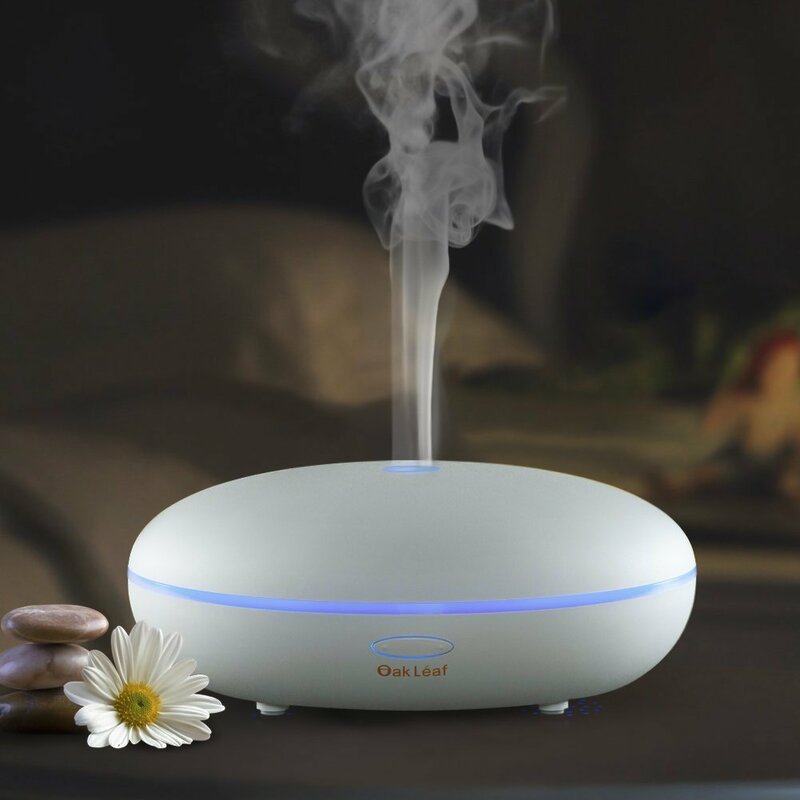 The mystical essential oil diffusers add atmosphere and a fresh, inspirational element to your home. Unlike strongly scented candles which can b misconstrued as a cover up of off-putting smells or an unclean home, diffusers highlight the your home, allow you to set a major stylistic influence, and show you care about its overall appeal. They welcome the first time visitor and communicate consideration. Thymes makes a wonderful north woods Frasier Fir diffuser oil perfect for the confir forests across Vermont. Innogear makes this natural bamboo automatic shut off diffuser with country charm. Landscaping is important to potential buyers. The curb is your first impression, so make a good one. Mow the lawn, weed the flowerbeds, and prune the bushes. Planting some small flowers can be a great, inexpensive way to add a pop of color. Another great way spruce up your curb appeal is buying a new mailbox, or repainting your current mailbox - make sure to keep it at 42-inches above the ground to meet federal regulations. 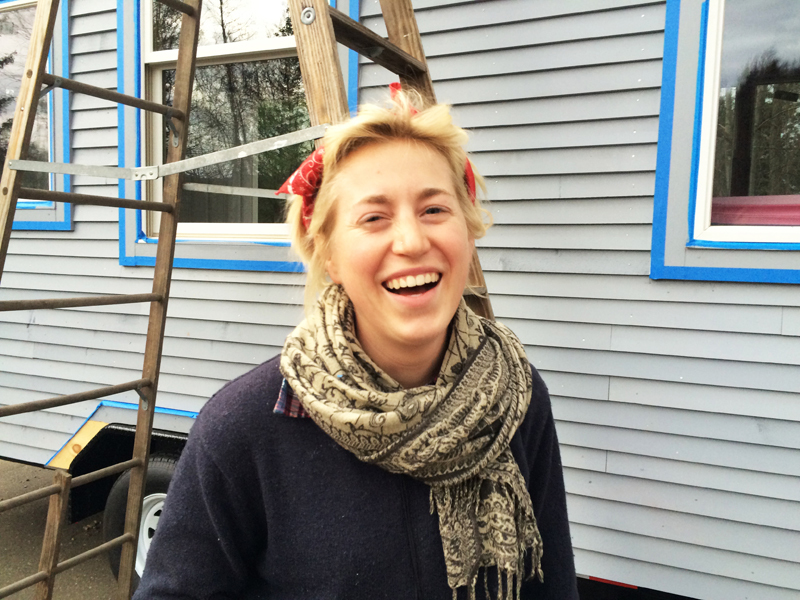 Montpelier,Vermont entrepreneur Katie Tomai, caulking gun in hand, draws an even bead along the loft window frame edge, prepping to paint her own very first home at Yestermorrow, the renowned Mad River Valley design build school. 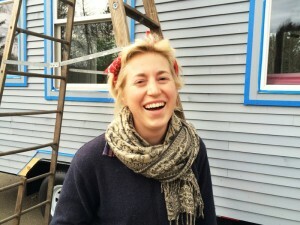 Katie's irresistible determination and focus inform her every day mission as she completes her vision after taking her tiny home project from the ground up in Warren. How often do you get to build your own house in class? Not having ever done any real building or carpentry, she's learning so much and excited about the post-painting stage, despite this first foray taking much longer than she initially imagined, to thread her electrical wire in place. 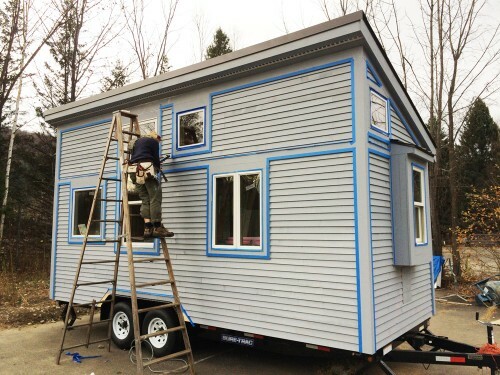 This amazing stick built gypsy home, derived from the tiny house movement, attached and glued to the Sure-Trac trailer to which it will stay married providing flexibility of view and place has recycled and new Anderson windows that open to let in the sun and fresh air. A dormer off the back with a big window means a sleeping loft with a view. 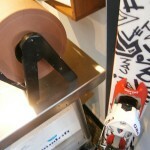 A window box at the front end for added cross draft. Ward Lumber Mill locally sourced pine siding from Moretown, foam board insulation (spray foam forsaken: off gassing concerns), a greywater filtration system for the biodegradable soap and water, and a composting toilet consistent with simplicity of purpose. No land in hand yet, she's aiming to be close to Vermont's state capitol, Montpelier and you can be sure she'll find something sweet to roll her living room onto. Katie's got a wonderful sense of style and the ability to execute her vision and get to the finish line. Yestermorow, she explained, is a wonderful place for "in-betweeners". Having been in Nepal after graduating from UVM in 2010, she's found an amazing mid-station. Miss Tomai has the right stuff, is off to an auspicious start, and is likely to be a multi-millionaire by the time she's 40. You can tell this super achiever has great things in store. Bravissima. 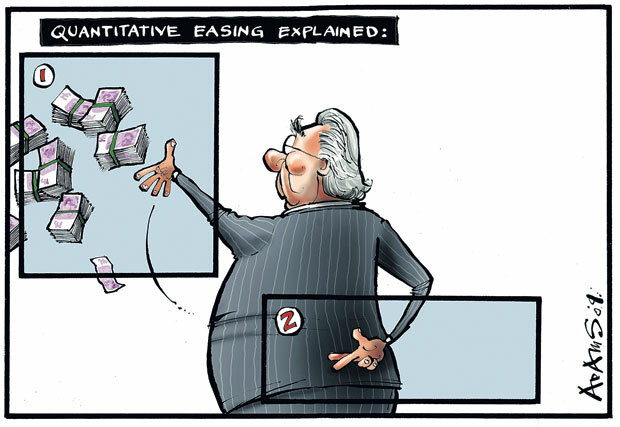 If there were awards for the most controversial investment terms, "quantitative easing" (QE) would win top prize. Experts disagree on nearly everything about the term - its meaning, its history of implementation, and its effectiveness as amonetary policy tool. The U.S. Federal Reserve and the Bank of England have used QE to weather financial crises. In fact, the U.S. has had three iterations: QE, QE2, and QE3. TheEuropean Central Bank (ECB), meanwhile, is prohibited by E.U. law from using QE. 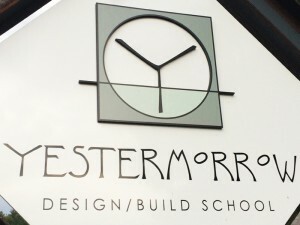 But that may have to change, some signs indicate. On April 3, 2014, at a press conference in Frankfurt, ECB chair Mario Draghi made the controversial, but not unexpected announcement that the bank could not rule out QE as a method for fighting the malaise of persistent deflation in the eurozone. Desperate times, desperate measures. So what's the big deal about QE - and does it work? In the United States, the Federal Reserve serves as the nation's central bank. To learn about the tools the Federal Reserve uses to influence interest rates and general economic conditions, see Formulating Monetary Policy andUnderstanding The Federal Reserve Balance Sheet. The Challenges Closer analysis of QE reveals just how complex the term is. Ben Bernanke, renowned monetary policy expert and chairman of the Federal Reserve, draws a sharp distinction between quantitative easing and credit easing: "Credit easing resembles quantitative easing in one respect: It involves expansion of the central bank's balance sheet. However, in a pure QE regime, the focus of policy is the quantity of bank reserves, which are liabilities of the central bank; the composition of loans and securities on the asset side of the central bank's balance sheet is incidental." Bernanke also points out that credit easing focuses on "the mix of loans and securities" held by a central bank. 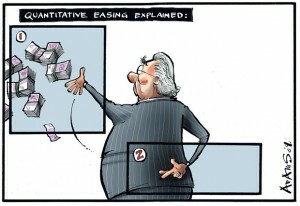 Does Quantitative Easing Work? Whether quantitative easing works is a subject of considerable debate. There are several notable historically examples of central banks increasing the money supply. This process is often referred to as "printing money", even though it's done by electronically crediting bank accounts and it doesn't involve printing. While spurring inflation to avoid deflation is one of the goals of quantitative easing, too much inflation can be an unintended consequence. Germany (in the 1920s) and Zimbabwe (in the 2000s) engaged in what many scholars refer to as quantitative easing. In both cases, the result was hyperinflation. However, many modern scholars aren't convinced that the efforts of these countries qualify as quantitative easing. In 2001-2006, the Bank of Japan increased its reserves from 5 trillion yen to 25 trillion yen. Most experts view the effort as a failure. But again, there is debate over whether or not Japan's effort can be categorized as quantitative easing at all. Economic efforts in the United States and the United Kingdom during 2009-10 also met with disagreement over definitions and effectiveness. European Union countries are not permitted to engage in quantitative easing on a country-by-country basis, as each country shares a common currency and must defer to the central bank. 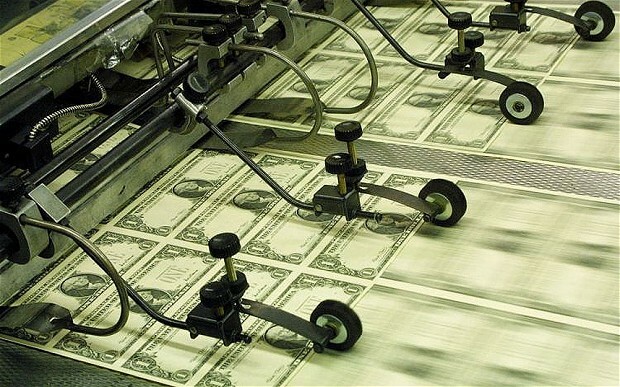 When Was Quantitative Easing Invented? 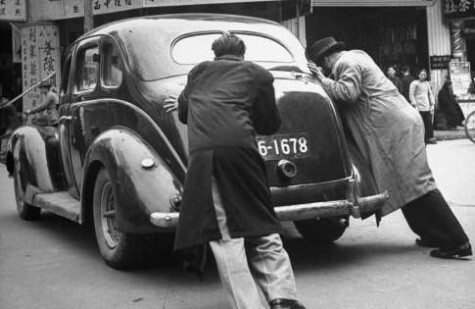 Even the invention of quantitative easing is shrouded in controversy. Some give credit to economist John Maynard Keynes for developing the concept; some cite the Bank of Japan for implementing it; others cite economist Richard Werner, who coined the term. The Bottom Line The controversy surrounding QE bring to mind Winston Churchill's famous quip about "a riddle wrapped in a mystery inside an enigma". Of course, some expert will almost certainly disagree with this characterization. Connect to maplesweet.com, e-mail info@maplesweet.com or call toll-free 1-800-525-7965 to find out more about market influence and updates, to list or buy property in Vermont, or with any inquiries. See the Maple Sweet Real Estate listings Portfolio and the newest Vermont mls listings. For several years the Fed used QE1, QE2 and in 2013 they used an additional variation of QE to continue the low rate environment while inflation was low and the economy continued to chug along at an anemic pace. In May of 2014 the Fed announced they would reduce QE bond purchases by 10 billion per month and discontinue QE by the end of October 2014. Up until that point 30 year fixed rates were in the low 3%'s. Once the Fed announced in May of 2014 that QE would end in October 2014 rates increased over 1% to the 4.250% - 4.500% range. Conventional wisdom said that 30 year fixed rates would continue to rise slowly throughout 2014 into 2015 when the Fed would begin raising rates again. Due to recent global economic volatility, and lower than expected inflation, we have seen conventional wisdom turned on its head. With the European economy slipping close to recession the outlook for this year is very different. We have seen a decline, rather than an increase, in long term interest rates. This phenomenon may not last so this is a great opportunity to secure a low fixed rate. If you missed the boat on refinancing or are looking to purchase a home the time is NOW. Interest rates are tied to the news cycle and it can change quickly. Connect to maplesweet.com, e-mail info@maplesweet.com or call toll-free 1-800-525-7965 to find out more about current interest rates, mortgage providers including MSA Mortgage, how you can qualify for home financing, how to submit a mortgage application or with any other financing related inquiries. 125 Breakaway Farm Road, Warren, Vermont. Sugarbush, VT Luxury Real Estate. 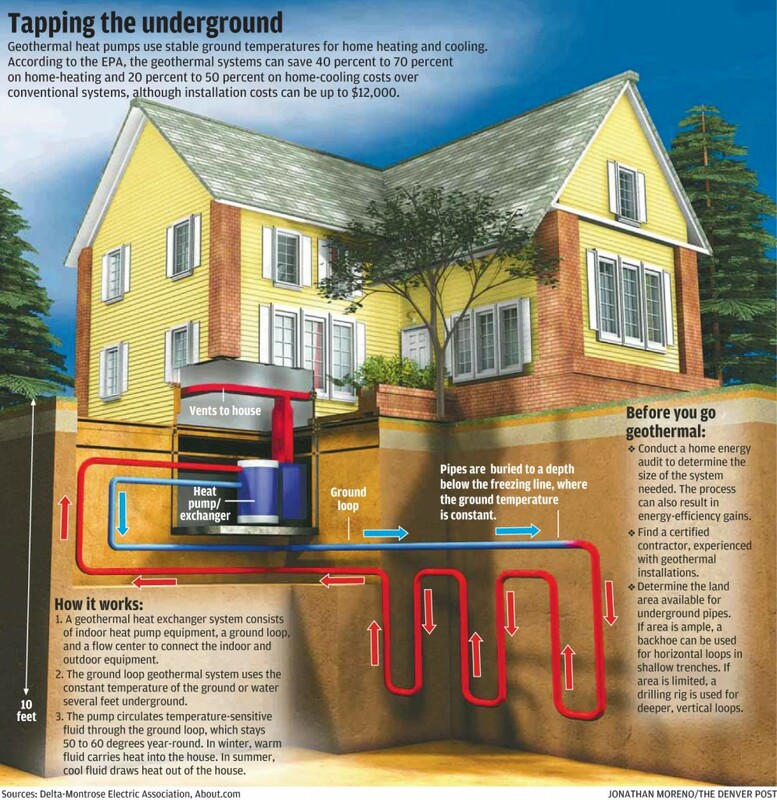 Geothermal exchange, aka geothermal heating and cooling, is spectacularly simple, at once enigmatically complex. Vermonters are capitalizing on this wonderful green technology known by some as cave man technology as pre-historic man escaped winter's harshness since the Paleolithic era in subterranean homes, making use of warmer temperatures below the surface from heat retained within the Earth since planet formation, radioactive decay of minerals, and absorbed solar energy. If you've ever loved going into your basement in the heat of summer as it's so much cooler than the rest of the house, you've enjoyed naturally occurring geo-thermal air conditioning. 55 degree ground temperatures five or six feet down remain constant year round. In Sweden and Switzerland more than 75% of new homes are built with geothermal. The Japanese know the merits of geothermal too. Across the archipelago volcanic mountain ranges are punctuated by natural hot springs. The common man head for the hills in droves, dipping into naturally heated waters from deep inside the earth, pulling relaxation and longevity. While we're missing the volcanic drama in Vermont, our water runs deep and is plentiful. 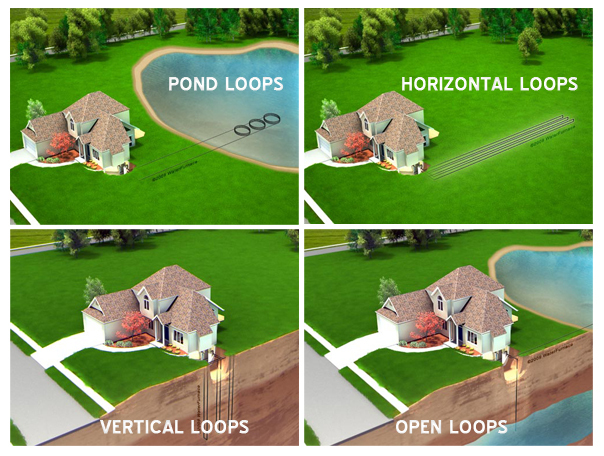 There are three types of home geothermal systems: closed loop, open loop and pond. Closed loops are most common and the only type allowed in some states, are horizontal (on level lots) or vertical and circulate the same water with environmentally friendly anti-freeze while open loop systems draw their water from a well, require substantial water, and expel used water after use. 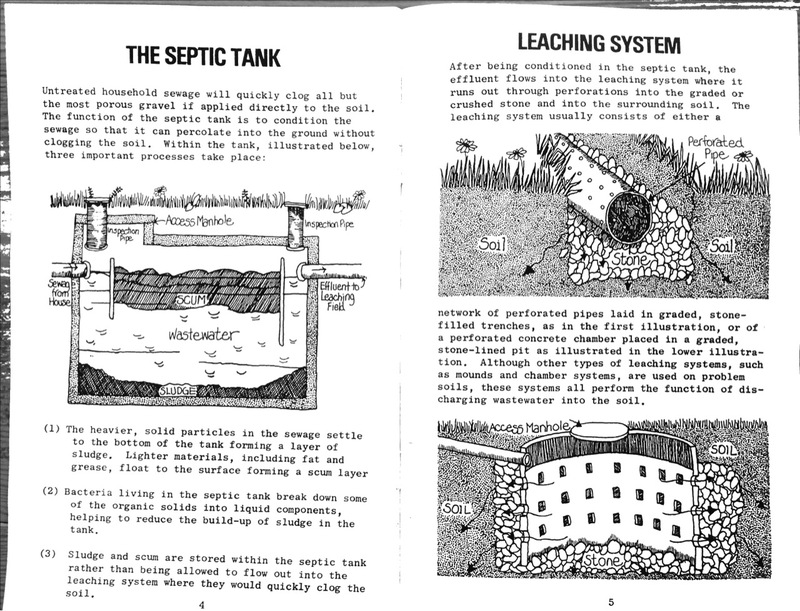 Pond systems have the coils laid at the bottom of six feet or deeper ponds. Geothermal is heat transportation rather than heat creation, up to five times more efficient than traditional heating systems rated at 78-98% efficient, and more than twice as efficient cooling. It is greenhouse gas free, non-polluting and doesn't contribute to the acid rain that fossil fuel heating produces, using just modest electricity to run the compressor, fan and pump. Maintenance is minimal with occasional servicing and filter replacement. A refrigerator extracts heat from the fridge, air conditioning contents. A heat pump works pulls heat from outside and compresses it to higher temperatures. "Geothermal Heat Pumps low-temperature heat to over 100°F and transferring it indoors involves a cycle of evaporation, compression, condensation and expansion. A refrigerant is used as the heat-transfer medium which circulates within the heat pump. The cycle starts as the cold, liquid refrigerant passes through a heat exchanger (evaporator) and absorbs heat from the low-temperature source (fluid from the ground loop). The refrigerant evaporates into a gas as heat is absorbed. The gaseous refrigerant then passes through a compressor where the refrigerant is pressurized, raising its temperature to more than 180°F. The hot gas then circulates through a refrigerant-to-air heat exchanger where heat is removed and pumped into the building at about 100°F. When it loses the heat, the refrigerant changes back to a liquid. 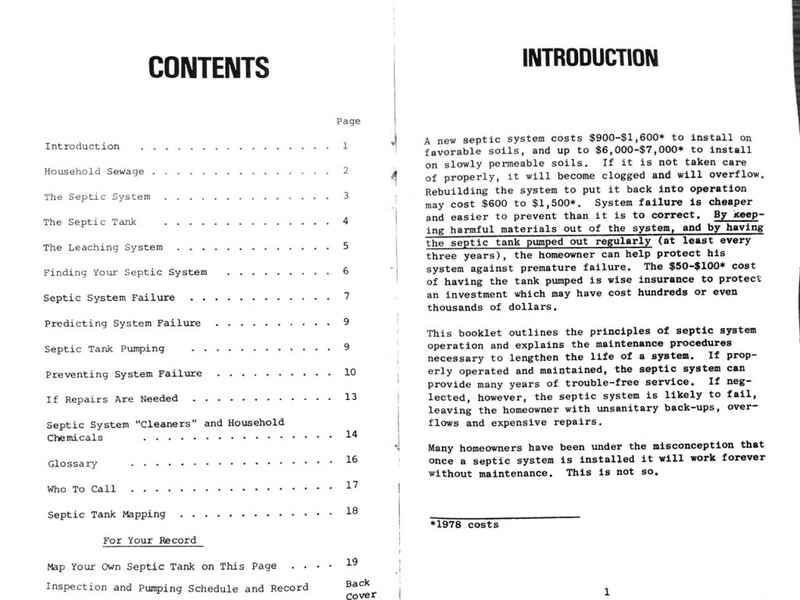 The liquid is cooled as it passes through an expansion valve and begins the process again. To work as an air conditioner, the system's flow is reversed." Dual-fuel systems include geothermal as the main heating system and a standard boiler or furnace to lean on in extreme cold. Cost-effective, environmentally conscientious, and sustainable, payback can come in just a few years, leaving dreaded and rapidly increasing oil and gas bills by the wayside. Fossil fuel liberation, this alternative energy source beckons. Maple Sweet Real Estate specializes in advanced technologies and has this geothermal home listed for sale. Connect to maplesweet.com, e-mail info@maplesweet.com or call toll-free 1-800-525-7965 for more info on geothermal heating and cooling, to set up a showing of this geothermal home or any other Vermont property, or to sell your home, condo, land or commercial property. Sugarbush VT Home for Sale. The Tower of Power. Septic Systems are, for most of us in Vermont, critical. 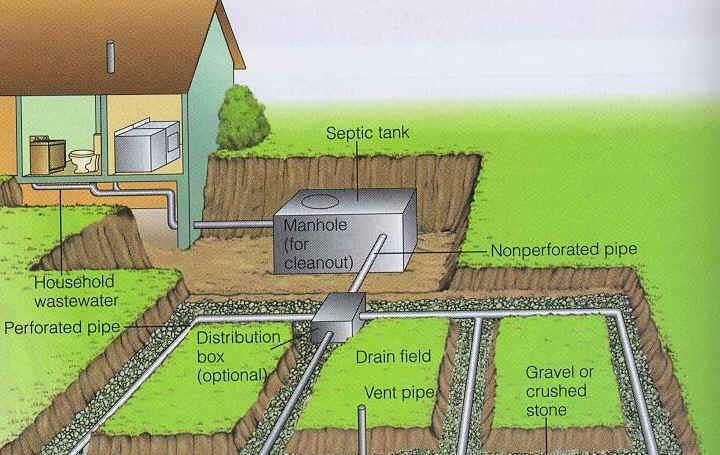 When buying a home or commercial property, knowing as much about the septic system you're buying can be huge. 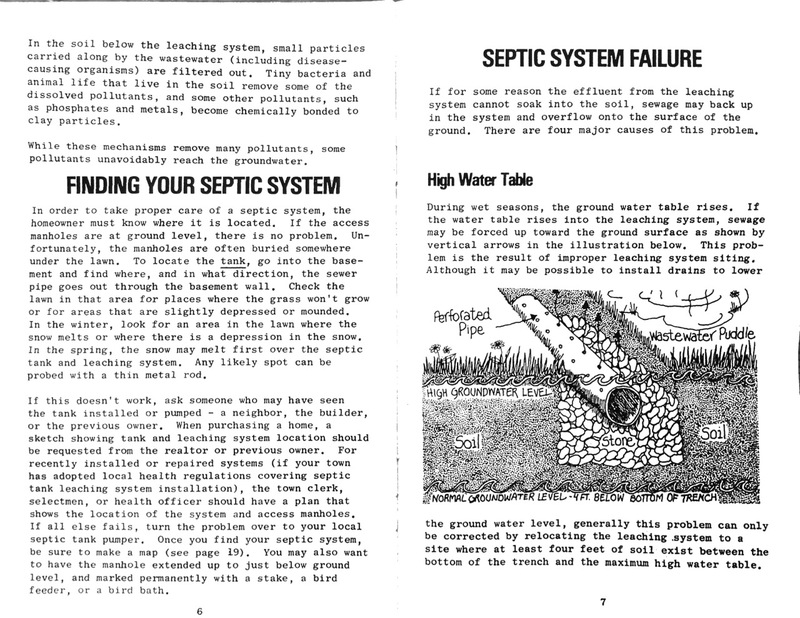 While standard home inspections cover the building itself, and some buyers will ask the septic tank be pumped and inspected, few well understand the leaching system in the ground and what ramifications a failed system can have on their bank accounts. 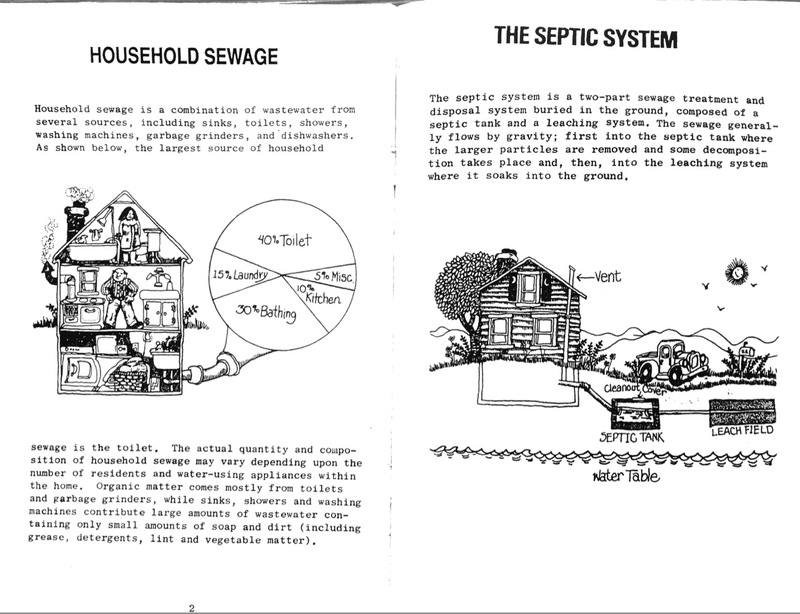 While at a septic tank pumping and inspection this week, Stuart Silloway, the self proclaimed "Wizard of Ooze" and owner of Silloway Septic Service out of Randolph, VT generously shared this wonderfully illustrated State of Vermont Septic Systems pamphlet from way back in 1978. 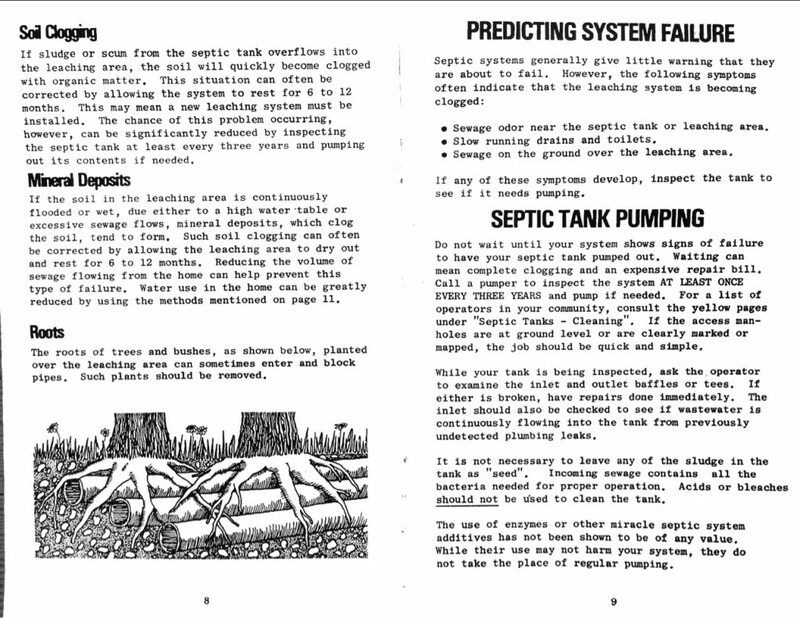 Times have changed a lot and inflation has brought up the quoted septic related costs dramatically: engineering and installing a new system today might run as little as $10,000 (vs $900-$1,600 in 1978) for an in-ground system to $30,000 or more (vs $6,000-$7,000 in 1978) for a pre-filtration above ground mound system, substantially more for larger commercial systems). The basics remain the same and this informational piece may help you better understand this important, fundamental subject for both property owners and purchasers given related potential homeowner and business owner expenses, among the highest property related expenses. 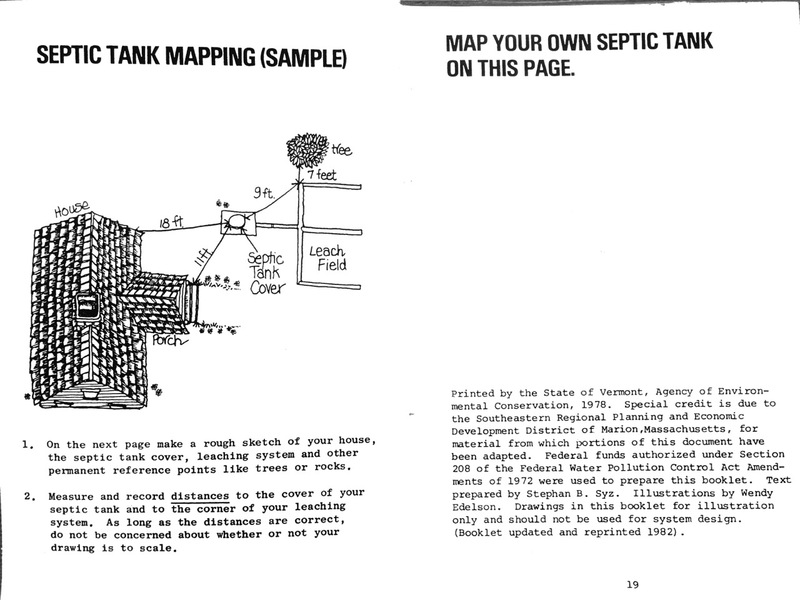 Connect to maplesweet.com, e-mail info@maplesweet.com or call toll-free 1-800-525-7965 for more info on septic systems, selling or purchasing a Vermont home, condo or land or any other aspect of Vermont real estate, homes and properties. 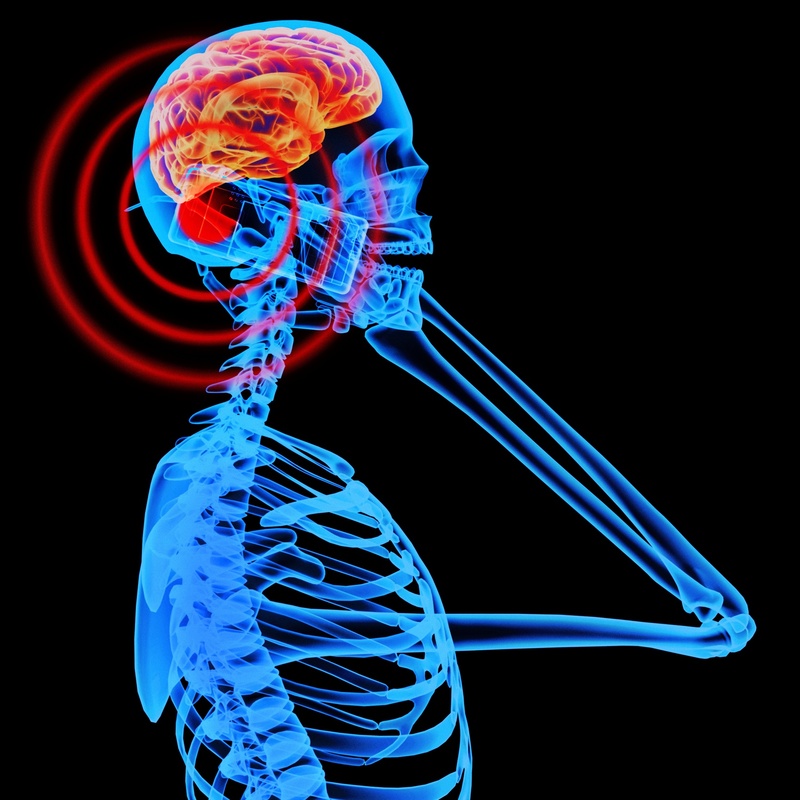 Smart Meters, Blood, Cancer and Headaches. Taking Back Your Power. My customers, a wonderful couple from New Jersey, are escaping urban sprawl for their lives. 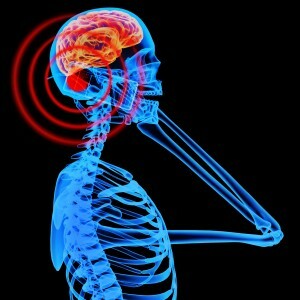 Maria is EMF (electromagnetic frequency) sensitive. She can tell when a house has a smart meter. 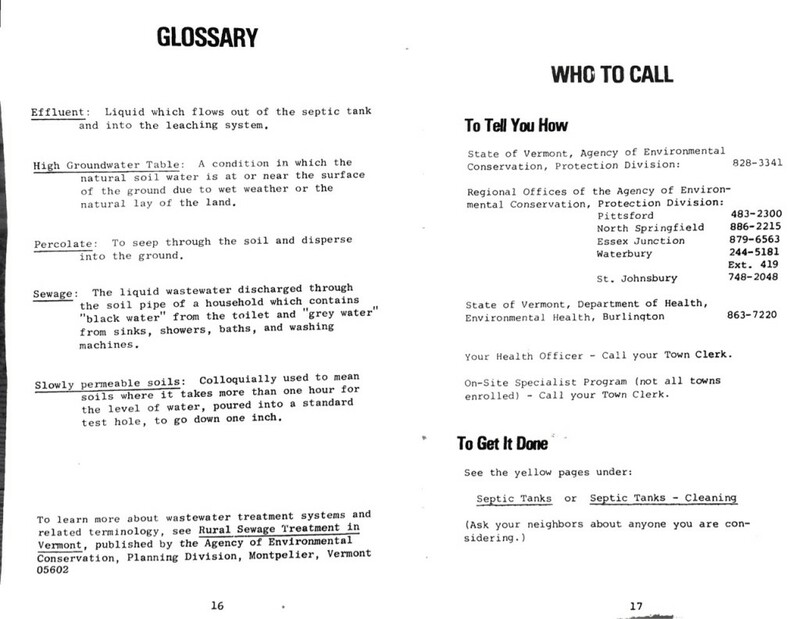 Green Mountain Power (GMP) offered hand held smart meters some years ago to monitor your power usage. It was a great promotion, an expensive meter offered at a major discount and I went for it. Within the first month it became clear the merits were dubious and I returned it to GMP. Smart meter technology has evolved and power companies all over the world are converting the main analog power box meters on the outside of houses to digital. 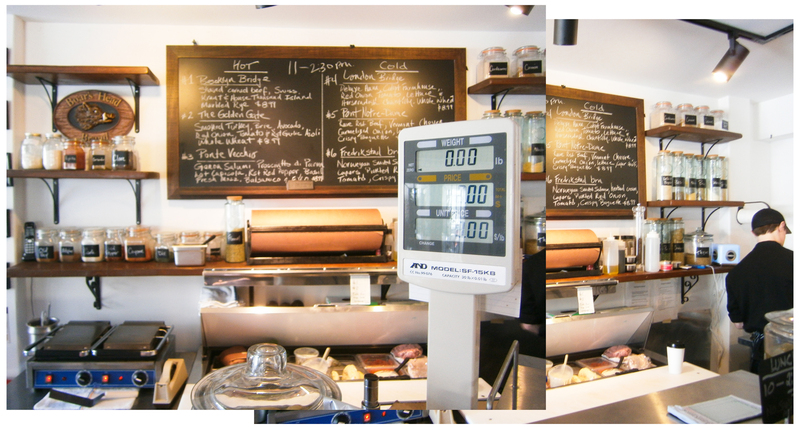 Here's what they look like: analog left, digital right. Maria can tell from her body when the analog meter has been replaced by a digital one. Her heart palpitates, headaches come on and she gets tinnitus (ringing in the ears). Extended exposure makes her feel weak, sick and insomnia begins. 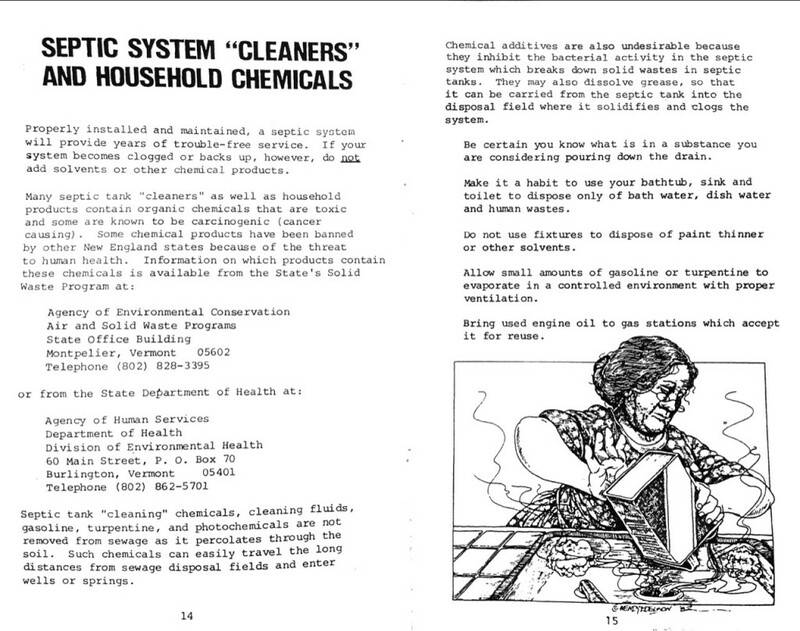 She has EHS (Electromagnetic Hyper Sensitivity), an environmentally induced functional impairment which experts estimate affects three to 15% of the population, expected to rise with chronic exposure. They're seeking refuge in Vermont. Once she realized the cause of her physical ailments they had the digital meter on their NJ home removed. Before they could blink an eye the power company replaced their neighbors analog meters with digital, just 20 or so feet away on each side of Maria's house, and the symptoms kicked in again. Her husband calls Maria the canary in the coal mine. 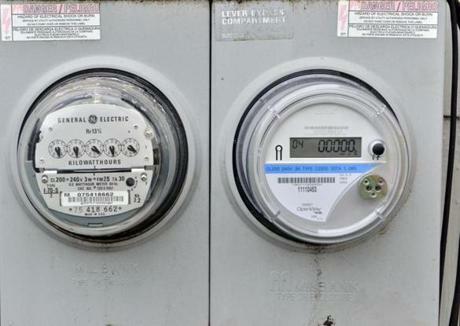 The Moretown home was not yet equipped with a smart meter but these two had my attention. She has purchased EMF protective clothing for defense which might strike some as over the top. Certainly enough to spike my interest and spur a little research. Vermont residents are keyed into health with strong penchants for organic foods and safety. 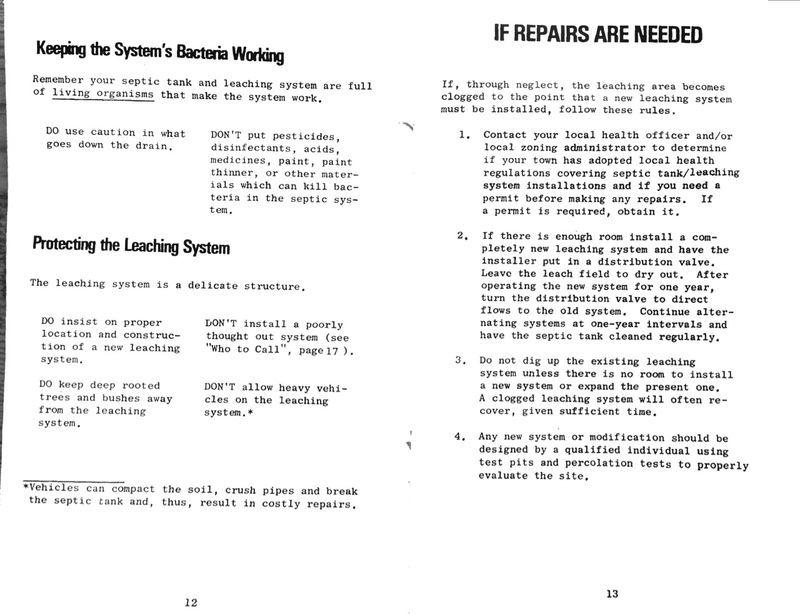 Lead, radon and water testing have long been staples of property inspections. 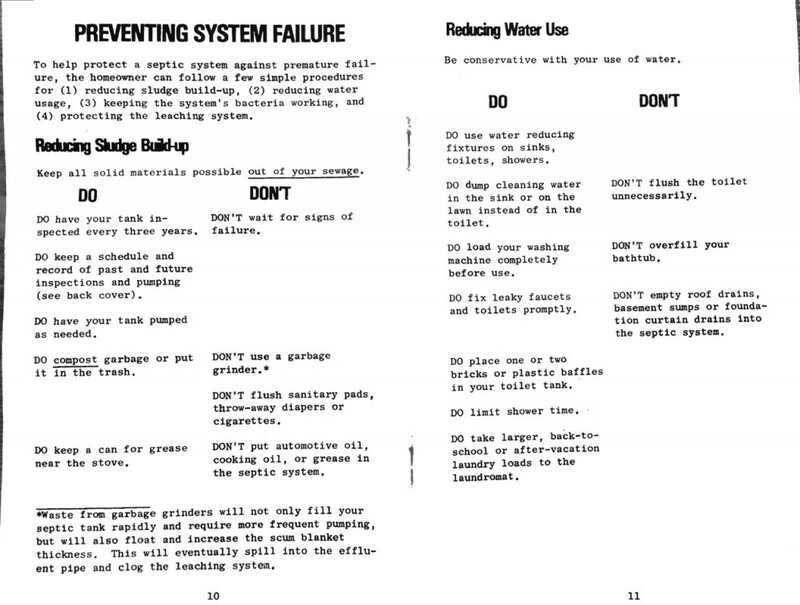 Green Mountain Power has a web page dedicated to smart power related health including that "We can't imagine doing anything that would jeopardize anyone's safety." The benefits for the utilities are clear. Matching consumption with generation, they avoid excessive energy stockpiling, eliminate monthly employee visits to read the analog meters, and dramatically improve their bottom line. Opponents shout corporate collusion and exploitation, even surveillance society big brother accusations. Power companies in the UK and beyond have announced plans to have smart meters on or in all homes. Other potential biological effects: leukemia, tumor growth, skin growths, abnormal cell activity, circadian rhythm disturbance, neurological and memory impairment, genetic defects, endocrine and hormone deficiencies, mental and behavioral problems, immune system issues, genetic damage, miscarriages and birth defects. Smart meters in some states have caught fire from excessive heat, lighting the houses they adorned on fire. 2011 saw the Vermont Public Service Board make a decision to move forward with the smart meter roll out, which led to street demonstrations and protests. 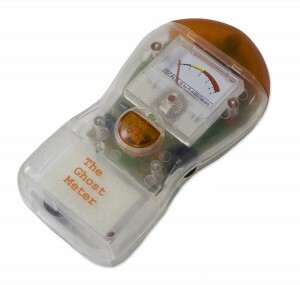 There are radio frequency measurement devices you can buy to measure the EMF levels. Amazon sells the Ghost Meter EMF sensor for just $24.95 including free shipping. Sitting at home, my son's recurring bloody noses came to mind and suddenly it hit me. Our own house? I walked out into the sub-zero late winter cold snap, and couldn't believe my eyes. 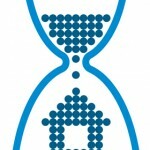 GMP had installed a smart meter on our house without permission or consent. 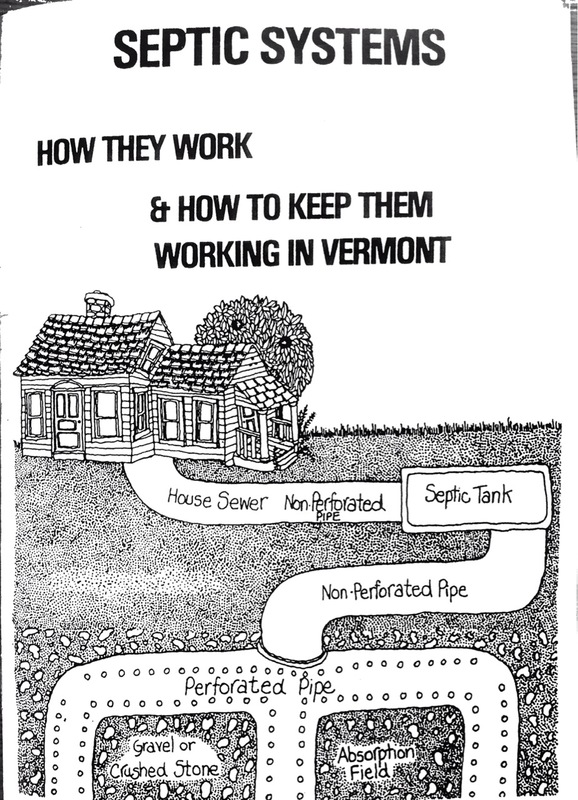 Fortunately Vermont has smart meter Opt-Out legislation (S. 214) and Vermont's legislature eliminated the opt-out fee in 2012. I called GMP this morning. They cited a mailing to homeowners which somehow I'd missed (though I confess I tend to throw out bulk mailings and anything but bills from the utility companies. They installed the smart meter in July of 2012. The GMP representative was very understanding and supportive, emailing me the opt-out within minutes, promising removal and analog meter replacement within a couple of days of receipt of the opt-out form. People looking to opt-out in some states have placed dozens of calls without action being taken. One power company came out with giant clippers following their customer's continued requests and protests over the phone and cut the home owner's power line to the house, severing them from the grid. While evidence on both sides of the debate is contradictory and leaves one attempting to separate fact from fiction, fear and loathing, we're erring on the safe side and looking forward to those comforting spinning anaolog discs back home. If you're a GMP customer and prefer to opt-out of your smart meter you can contact GMP Customer Service at (888) 835-4672 or pull the opt-out form here: GMP Smart Meter OPTOUT form 3.6.14 CVPS can be reached at 800-649-2877, Washington Electric at (802) 223-5245, For other Vermont power providers, contact your own utility as the state requires the opt-out option for all power providers without cost to you. What's your opinion on these digital smart meters? Have you experienced health affects, are you EHS, or do you find the movement against smart meters unreasonable? Connect to maplesweet.com, e-mail info@maplesweet.com or call toll-free 1-800-525-7965 for more info on smart meters, selling or purchasing a Vermont home, condo or land or any other aspect of Vermont real estate, homes and properties. You really make it seem so easy with your presentation but I find this matter to be actually something which I think I would never understand. It seems too complex and very broad for me. I'm looking forward for your next post, I'll try to get the hang of it! Thank you so much for taking the time to read it. Have a great week. 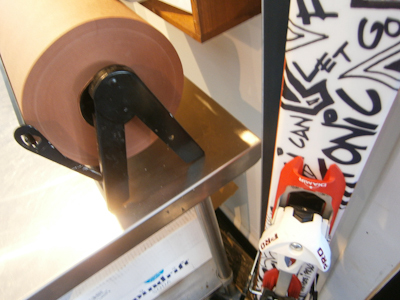 Hot off the slopes, apres-ski takes on a new meaning with Mad River Valley gem The Bridge Street Butchery in historic Waitsfield. Fresh Oysters, hot bouillabaisse or cold sushi, sword fish, organic beef, Vermont smoke & cure bacon, Cabot Clothbound Cheddar, fennel sausage jambalaya, partridge, duck or venison are here to grace your table. While Vermont has a long tradition of culinary exploration and finesse, finding a good corner delicatessen style butchery is something else, especially in rural paradise. It's a long way to Grace's Marketplace or Eli Zabar's in NYC, and still a trek to get to the wonderful City Market Coop in Burlington and Hunger Mountain Coop in Montpelier, and for those of us aspiring gourmets and bon vivants stuck in back-country Vermont with the black-bears and telemarkers, the Bridge Street Butchery is bliss. 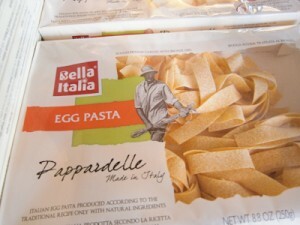 It's more than just an exquisite nibble. Jeff Lynn owned the Sweetwood Bar & Grill in Warren and brings depth and experience and has put together a team that excels in providing customized, warm and attentive service, another elusive pleasure in rural Vermont. I met Jeff today just before noon cooking up a Count Neck Clam Chowder with clams from Scituate on the Cape, Von Trapp Whey Fed Sausage weaned on Sean Lawson's Finest Liquids grain, & organic garlic for staff mid-day re-fueling. Conquering Sugarbush and Mad River Glen lead to real hunger. Check out Justin's meat balls, Gaylord's heirloom tomatos, Maplebrook Farm fresh or smoked mozzarella, Thai sweet potato, coconut and lemon grass soup, Green Rabbit baguettes, prime rib eye, a Neill Farm brisket sandwich, Irish bangars, smoked Faroe Island Salmon, Niman Ranch flank steak, Ancho chili rubbed baby back ribs or Portugese sardines for your grill. 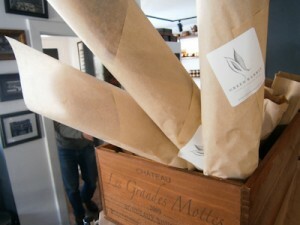 Everything is fresh, nothing frozen, the store reborn with new selections each week. Work in progress. Call (802) 496-3474 or email Jeff at bridgestreetbutchery@yahoo.com today to secure your order of made on site brined corned beef in time for Saint Patrick's Day. The Bridge Street Butchery was born from catastrophe. August 28th, 2011 Hurricane Irene struck Waitsfield. The Mad River breached, flooding historic village sweeping one building completely off it's foundation, wiping out the four main floor businesses at 40 Bridge Street in the Blue Building including the former popular Green Cup Cafe. From that void sprung The Peasant, Chris Alberti's italian wonder restaurant, The Sweet Spot (Sweet Simone's & Scout's Honor) run by Lisa Curtis & John Vitko, and Jeff Lynn's Bridge Street Butchery. With the Artisans Gallery across the driveway, vegetarian restaurant extraordinaire Mint west, the covered bridge east, Troy Kingsbury's charming Village Grocery on Main, the Joslin Memorial Library, David Sellers' Madsonian Museum of Industrial Design, Sherry DeFlavio's wonderful boutique 4orty Bridge and Maple Sweet Real Estate at the corner, this is a mecca for foodies and art lovers, tucked away from the crowds of more commercial Irasville. 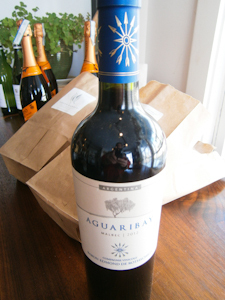 To wash it all down, check out Jeff's selection, all tasted before offer, of fine bubbly, Chardonnay, Cabernet, Argentinian Malbec, Merlot, & Pacific Northwest Pinot Noir. 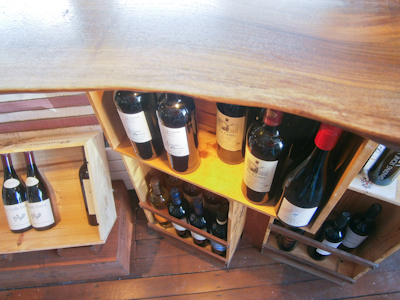 With his culinary flair and restaurant history, Jeff's oenological savoire faire adds an important layer to the chopping block. Connect to maplesweet.com, e-mail info@maplesweet.com or call toll-free 1-800-525-7965 for info on the finest real estate, selling or purchasing a house, condo or land in Vermont, to get details on local Vermont real estate market conditions or culinary ideas. Jeff, this is genius, great stuff man! proud of ya.